I love easy sewing projects. I also love easy quilting and fabric-piecing projects. It can be hard to find a project that is still easy, but incorporates both. 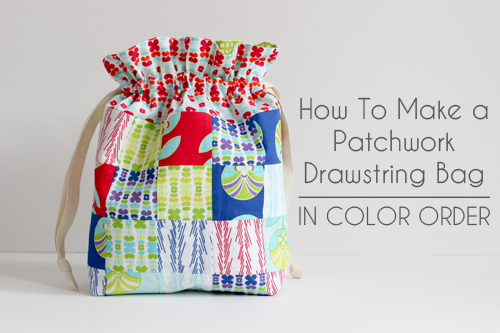 This tutorial by Jeni Baker from In Color Order has the best of both and shows you how to make a very professional-looking but easy lined drawstring bag. These kinds of quick-sew bags are great – I always see the kids at my son’s school carrying little drawstring bags around with their athletic clothes and other little fun extra things they may need during the day. If you have a ‘tween who has been wanting to learn to sew or quilt, this may be just the perfect easy project for them to start with (and will be something they will use for sure.) If not, this will become one of your “go to” scrap-buster, just-easy-enough-to-be-relaxing sewing projects you will want to make all the time.